The Library buildings are the earliest Balliol College buildings still surviving. A stone building, with the Library on the first floor and chambers beneath (now the Old Common Room), was constructed between the Hall and the Chapel, on the north side of the front quadrangle, in two phases. The five west bays nearest the Hall were completed by 1431, largely at the expense of Thomas Chace, a former Master and one-time Chaplain of Humphrey Duke of Gloucester. The four eastern bays were built by Robert Abdy (Master 1477–94), presumably to house the books bequeathed to the College by William Gray, Bishop of Ely, who died in 1478. Only the walls and windows remain; the low-pitched roof and battlements are apparently by Wyatt (c.1794), who also created the plaster vault, plaster on the walls, and book cases which replaced the last of the medieval lectern-desks. The Reading Room is in what was the original College Hall, built on the west side of the front quadrangle by 1430. The pitch of the roof was lowered and a crenellated parapet added probably by Wyatt in c.1792. The Hall was extended by taking in the screens passage, and Salvin’s Tower was added at the north-west corner of the quadrangle in 1853. When the new Hall was built in 1877 the old Hall was converted into an undergraduate library. In 1959 a mezzanine floor was constructed across the middle of the building to create a Reading Room, with book stacks on the ground floor and in the basement beneath. The Tylor Law Library, formerly housed in the Russell Room on Staircase XVI, was moved in 2000 to rooms on the Library Staircase which had long been used by Maurice Keen, History Fellow. The Old Library originally had a window in the east wall. After the building of the Chapel of 1522–29, this window looked into the ante-chapel. The glass showed Thomas Chace and the fellows kneeling before St Catherine of Alexandria, the College’s patron saint (see image). 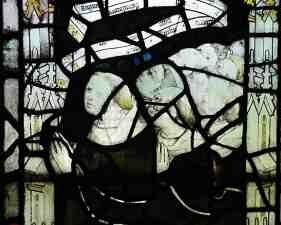 In 1800 Thomas Chace and the fellows were releaded into one of the ante-chapel windows, and are now in the Chapel. The windows on the north and south sides of the Old Library were glazed with coats of arms commemorating benefactors. They include Thomas Chace (a canting coat showing three talbots’ heads erased sable – talbots were dogs of the chase) with the earliest known representation of the arms of Oxford University beside (see image), as Chace was Chancellor; Robert Abdy, William Gray, Humphrey Duke of Gloucester, George Neville, and John Alcock, founder of Jesus College Cambridge. Each window had two coats of arms, one in each light, and round each was a Latin verse rhyming with the verse in the next light. At the bottom of each light was a ‘saint’ sitting in a chair. The verses have been destroyed; and of the ‘saints’ only two prophets (moved to the Library landing window) remain. The windows now contain just coats of arms and tracery lights, patched with little pieces of van Linge glass from the seventeenth century. More images and information about the armorial shields in the Library stained glass here. The Reading Room windows also contain the coats of arms of benefactors on the east side. In the top lights of windows on the west side are portraits of Spenser, Shakespeare, and Milton. They date from Jowett’s time, when the former Hall was converted into an undergraduate library, and suitably decorated. Plaster copies of sections of the Parthenon frieze then dignified the walls.